A photographic Archive of the period. All photographs appear by courtesy of the Derby Telegraph unless stated otherwise. Princess Marina of Greece, the Duchess of Kent, arriving at a factory visit which took place on the 28th April 1945. The Duchess of Kent had been widowed only three years earlier when her husband had been killed in an air accident on active service with the RAF. She was presented with a harlequin coffee set in the "Vine" pattern together with a miniature tea service. If anyone knows who is sat at the table I would be delighted to include the information. Does anyone know the name of the staff member? Two images taken during a works outing to Ludlow Castle dated 1949. Doris Finney is standing centre left with her husband Fred on the right. A series of four pictures taken during a factory tour. The Telegraph reported on factory visits of particular significance, and this may be that of Mr George Isaacs, Minister of Pensions. The date of the cutting is is unknown but it refers to the recent cabinet changes which we know occurred in January of 1951. In a photograph which appeared in the paper he was accompanied by his private secretary Mr A F A Sutherland, Mr W E Davis (North Midlands Regional Controller, Minister of Labour), Mr H Boardman ( Parliamentary Secretary to the minister of Labour) and Mr J K McArthur (Derby District Officer of the Ministry). If anyone recognises a family member please get in touch via the contact page. 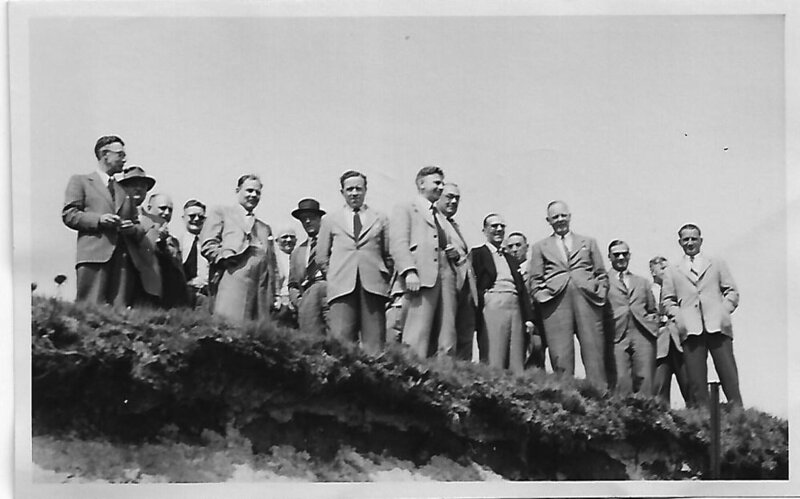 We believe that the gentleman second from the left is Councillor Zachariah Padgin Grayson (Mayor of Derby 1951-52) but if anyone can confirm this please get in touch via the contact page. 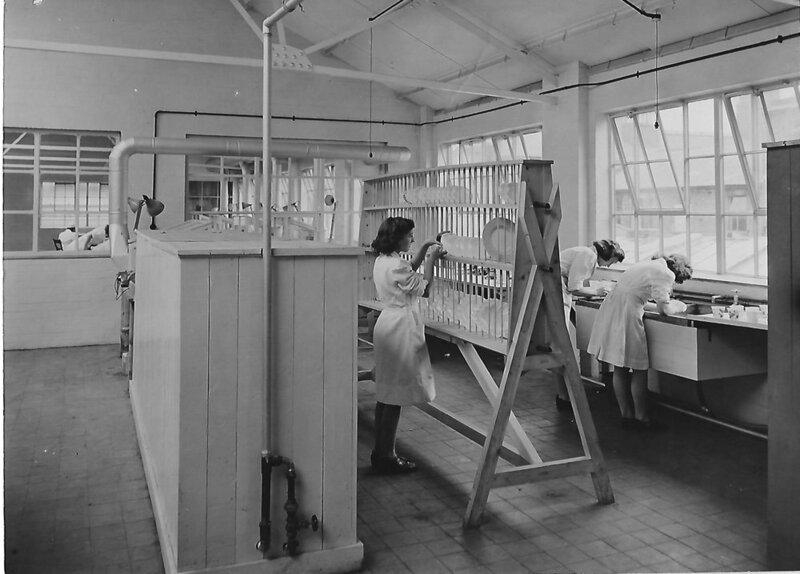 Factory tour photograph taken prior to 1953. If you recognise the visitors please let me know via the contact page. Christmas party which we believe dates from 1952 as a copy of the photograph in Joan Midgley's family archive was dated by her as such on the reverse. The event was probably held at the Churchill Hall. Those seated on the front row left to right are as follows:- Colin Osborne, Eric Robinson, Mrs Edna Robinson, Mr Edward (Ted) Peake, Mrs Eileen Jones, (Her son Neville is at her shoulder), Philip Robinson, His Mother, Unknown, Mrs Dorothy Robinson, Mr Finney, Mrs Finney, Unknown. Joan is standing in the back row, left of centre and wearing the fox fur stole. Another Christmas Party. The Telegraph reported on two Christmas Parties, the first was held on Tuesday 23rd December 1947, the second on Wednesday 22nd 1948, and both were held at the Railway Institute. The above photographs were part of a series taken on behalf of the Central Office of Information, the UK’s marketing and information agency which was set up in 1946 as the successor to the wartime Ministry of Information. Some of the images come from the family archive, but we are very fortunate that Brenda “Pip” Bentley assembled a collection of photographs during her long career at Royal Crown Derby, becoming the custodian of many upon the retirement of her fellow staff members. Perhaps more will come to light in due course. The date of these is unknown, but is suspected that most were taken in 1951/52. Mary Murray is on the far right of the image entitled "Burnishing Shop", but as yet we do not know the names of the others. The image of Miss Clara Smart shows her burnishing part of the service ordered in 1951 by the Pakistan Government for use in their embassies, and the photograph cannot therefore have been taken prior to that year. The penultimate image shows three enamellers and can be approximately dated from the June 1954 edition of the Everywoman magazine on the bench. The final images are taken from an undated leaflet which was included in boxed fancies, and which probably dates from 1953-55. Reuben Hague is shown painting the Queen plaque. This image has been scanned from a cutting taken from the Derby Evening Telegraph of Friday December 17th 1948. The caption reads "Mr Alan Turner "shooting" at the Royal Crown Derby China works this week for a coloured film that is expected to be shown throughout the world". The film entitled "Crown Derby" was premiered at the Waldorf Hotel, London on October 17th 1949. Can anyone tell me the names of the three staff? A photograph showing employees of the Royal Crown Derby Porcelain Co with relatives and friends who were guests at a social at the Churchill Hall on the Monday before going to the opening performance of "Chu Chin Chow" at the Grand Theatre on Tuesday March 8th 1949. The first of a series of images of the visit to the Factory by Princess Elizabeth on Monday June 27th 1949. Pathe filmed the event and this is a link to the newsreel - it begins with a factory visit in Macclesfield - https://www.youtube.com/watch?v=UZQQFchpodw Some of the images of the Princess' visit are scanned from the original still photographs, but others have had to be taken from newspaper cuttings. The quality is therefore variable, but it seems that not all of the original photographs have survived. Fred Ellis is in the lower left corner, with Thomas Kirk to the right of Harold Robinson. Tom Wilkinson is believed to be standing bottom right. Who is peering through the window? In an article which appeared in the Derby Telegraph on Monday February 11th 2013 Brenda "Pip" Bentley recalled that her supervisor, Joan Midgley "gave me my bus fare and sent me all the way home to Melbourne to fetch some more flowers to decorate the work tables in the rooms.... When I arrived back, I couldn't get through because of all the police and crowds outside the factory. I told one of the policemen who I was and he sent for Mrs Midgley and I was rushed straight through. ... Rather than the Princess having to go into all the small rooms which used to make up the factory in those days, some of the tables and workers were moved out into the corridors. My table was one of them but, because I had been sent out for the flowers, Mrs Midgley took my place at the table and picked up the plate I had been decorating. I was left to peer through the window of our workroom as the Princess walked by." Betty Bailey is sitting with her back to the Princess with Joan Midgley to her left. Miss Emma Foster is standing opposite her. The wooden box with the wires is apparently a device to measure the contraction and translucence of pottery before it is fired. Fortuitously the Telegraph published a list of persons met my the Princess during her factory tour. I believe that this image shows Donald Holmes, a 17 year old apprentice presser. We know who the Princess was talking to, but can anyone put names to the other faces? If anyone has further information regarding David Harrison I would be delighted to hear from them. I would be very interested to find out who the staff member is on the left of this photograph. Doreen Benton (the paper misspelt her name) is on the left of the photograph with Miss Clara Smart on the right. 22nd March 1950. Richard Dimbleby at Royal Crown Derby to record "Home Flash" for the BBC, a radio programme designed to have a National Savings flavour but which was "intended primarliy to paint a picture in words of Derby for overseas listeners, especially the Forces". Joan Midgley is at the table. She is enamelling a Vine A972 National and Derbyshire View plate and wearing a brooch and matching earring set. In the centre of the table there is a log vase with china flowers and on the right, part painted peacocks low and tall. A tray of brooches is placed bottom left. 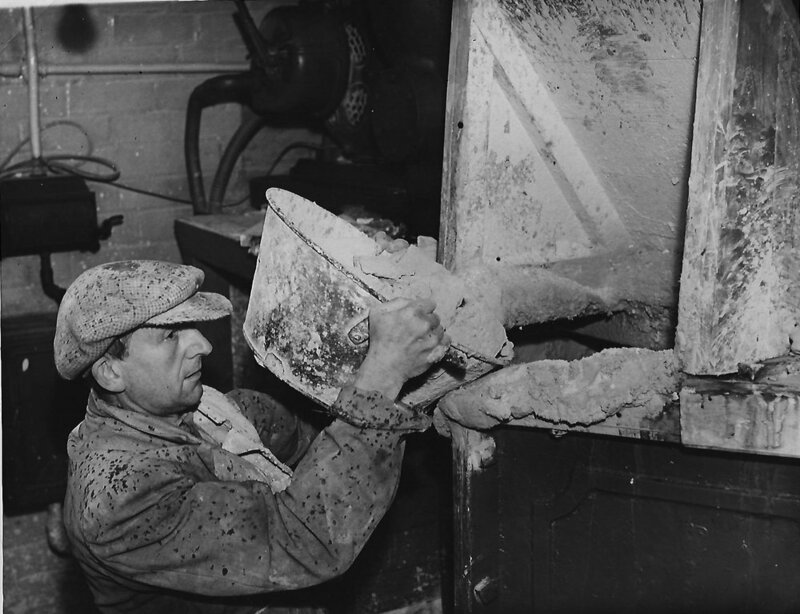 There is what appears to be a lathe as seen through the window in the room behind but I have seen a similar device used for polishing/grinding to remove any minor imperfections in the finished ware. Phillip Robinson and Colin Osborne are shown here together with Miss Emma Foster of 58 Dashwood Street, Derby who was also in the programme, having been employed at the works for 48 years since the age of 13, as a gilder. I wonder if a recording still exists? The Derby Evening Telegraph Telegraph reported the presentation of this plaque to the citizens of Derby in the above article which appeared on the front page on Monday May 5th 1952. Constance Clark demonstrates her gilding skills to visitors on a factory tour. Although unsure of the date she believes that this photo was taken in the mid 1950’s. Does anyone recognise the visitors? If so please get in touch via the contact page. Two images taken on a Pottery Federation trip to St Austell. I don't know the date but suspect that it occurred in the mid 1950's. Phillip Robinson and Colin Osborne appear in both photographs. If you recognise any of the other individuals let me know via the contact page. A visit to the Royal Crown Derby trade stand on May 4th 1955 by Princess Marina, the Duchess of Kent accompanied by her son Prince Michael. The Derby Evening Telegraph reported that on the same day the stand was visited by the Panamanian Minister and his wife who was formerly Miss Margot Fonteyn, the ballerina and film star. The Duchess is also reported to have visited the trade stand the year before accompanied by her daughter, Princess Alexandra (Derby Evening Telegraph Tuesday May 11th 1954 - page 10). At this event the Telegraph gift to the Corporation was on show. To date I have found no photographs of the 1954 trade stand. A view of the trade stand in 1955. Queen Elizabeth and the Duke of Edinburgh visiting the Royal Crown Derby trade stand at the British Industries Fair held at Olympia on May 10th 1955. 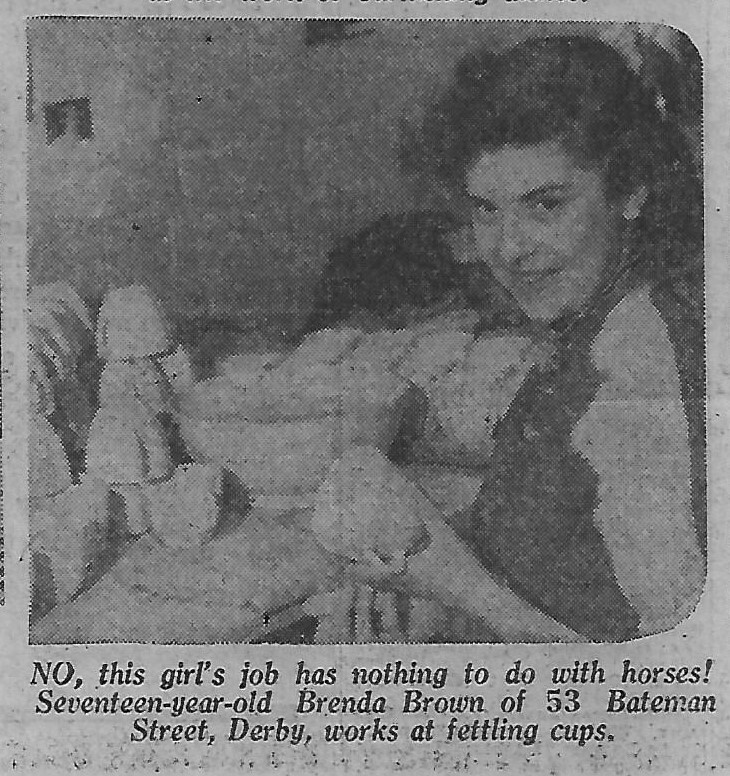 This article headed "Lady Eden sees Derby Artistry" appeared on the front page of the Derby Evening Telegraph on Thursday February 23rd 1956. This year a more elaborate display was set up with fitted shelving units. Just over 5 months later the Suez Crisis began when Egyptian President Gamal Abdel Nasser announced the nationalization of the Suez Canal Company, the joint British-French enterprise which had owned and operated the Suez Canal since its construction in 1869. The resultant involvement of British Troups in a military action with France and Israel led to the United States pressurising the UK and France to accept a ceasefire and to a UN Resolution publicly condemning the invasion. The failure of the British intervention and souring of relations with the US were significant contributory factors to the resignation of Prime Minister Anthony Eden in January 1957. The waning of British influence in the region also adversely impacted on sales of Royal Crown Derby in the Middle East. The purpose made shelving was assembled at the factory and transported to London to be installed at the venue by the works employees. Twelve new patterns were on display. In an article which appeared on the same day in the Derby Evening Telegraph of Friday February 24th the royal party is reported to have bought fruit knives. They were also presented to Peter de Waller, company overseas sales director, a familiar face as he had previously worked as manager of the Royal Opera House in Covent Garden. 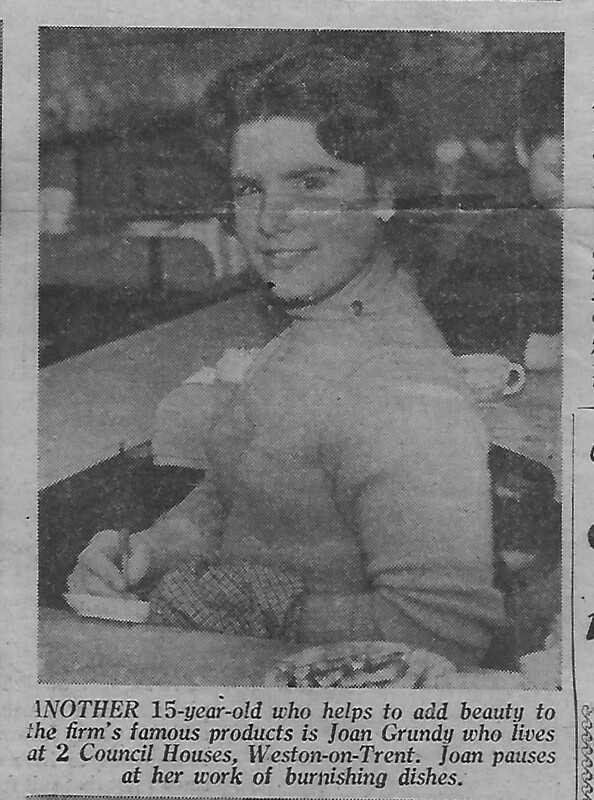 The above photographs appeared in the Derby Evening Telegraph Picture Edition of Friday February 24th 1956 under the heading "Meet the Girls at Royal Crown Derby" I have had to scan the images from a cutting taken from the paper and hence the quality has suffered. The caption under Ann Reading and Flora Dutch is as follows "16 year old Ann Reading of 14 Upper Bainbridge Street, Derby, carries out a job which is not for the nervous or those with shaking hands! She is packing some of the precious goods in the warehouse. Above can be seen some of the firm's most famous designs. Flora Dutch (18) of 135 Weston Road, Aston-on-Trent is enamelling plates".